It was left to Geoffrey Cox QC, the current Attorney General, to give the biggest mention to law on the last day of the Conservative Party Conference today. 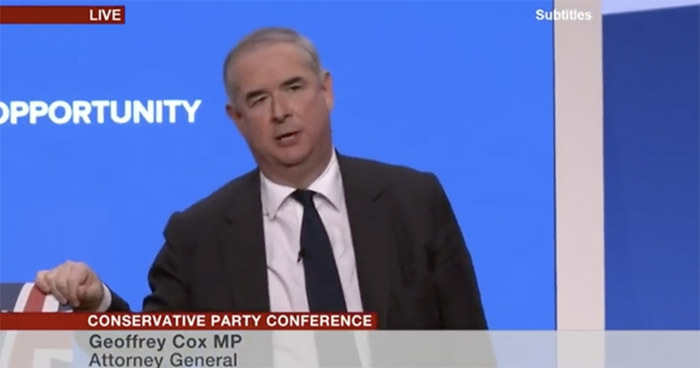 Cox, who is a hugely successful barrister acting in commercial and fraud cases but who has also defended a number of individuals in war crimes and defamation cases, took to the stage (video below) at the conference in preparation for Theresa May. Cox has come to the attention of Legal Cheek before now: in 2015, we reported on his bar earnings being at a whopping £800,000. Cox also shot to fame in the wake of the shake-up of MPs expenses, when he had been found to have claimed for 49p for a bottle of milk and £2 for tea bags. But May’s actual closing conference speech didn’t mention ‘justice’ or ‘legal aid’ once. Indeed, the speech was pretty light on content generally but particularly light on content relating to access to justice, legal aid, court closures, mentioning instead housing initiatives and fuel price freezes. “Our courts are incorruptible and our universities world-leading”. May did, however, give a nod to lawtech and AI-justice with her proposal that rail commuters are to be given “auto-compensation” when their trains are late. It’s an idea that could go far: auto-compensation for car accidents anyone? Just type in your injuries and the insurance company will sort the rest? Other legal news from the conference was a fringe event held by Justice, the law reform and human rights pressure group, and the Society of Conservative Lawyers, where Lucy Frazer QC MP spoke about the growth in judicial review cases. Meanwhile, justice secretary David Gauke gave a speech to delegates earlier in the conference focusing mostly on prison-related issues. The post Tory conference: Attorney General steals limelight from Theresa May’s speech appeared first on Legal Cheek.